MPT also provides online student tutorials for Microsoft Word, Excel, PowerPoint and Access. FITS (Faculty Instructional Technology Services) has created a series of instructional videos for faculty creating and updating courses in Desire2Learn. These videos can be found and viewed at the Teaching Commons website. Additionally, MPT (Media Production and Training) has posted a series of training videos for DePaul students on iTunes U. 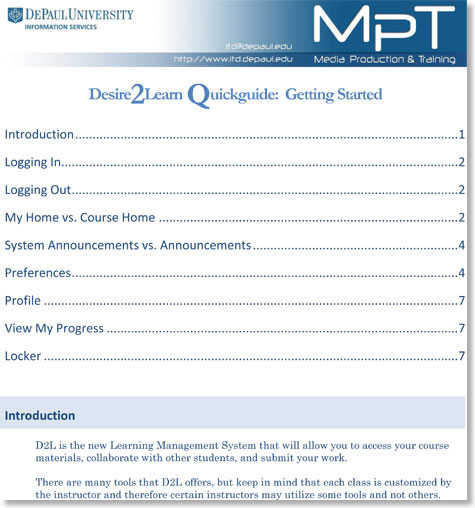 These videos introduce Desire2Learn, and the go into more detail on how to use the various functions within D2L.